Jeff checking back in from the Eldorado out of Long Beach Sportfishing fishing San Nick. They had some wind to deal with early morning, but it wasn't much trouble for the Eldorado as they put on a mess of rockfish, lingcod, sheephead, and whitefish. Jeff is live below to tell you all about it. 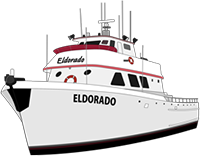 The Eldorado is a go for tonight with trips all month long.